Super quick and easy to make- this cheesy chia popcorn recipe is a great way to get more nutritional yeast into your diet. 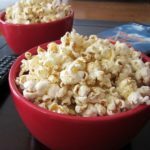 Cheesy Chia Popcorn – – Unpopped popcorn, melted coconut oil, nutritional yeast, chia seeds, of Himalayan salt, onion powder, smoked paprika, garlic powder, Place the yeast, seeds, salt, onion, paprika, and garlic in a food processor or spice grinder, and whiz for 30 seconds, or until finely ground. Place the yeast, seeds, salt, onion, paprika, and garlic in a food processor or spice grinder, and whiz for 30 seconds, or until finely ground. Pop popcorn by heating in a pan with a lid, and drizzle with oil, stirring to coat. Sprinkle with desired amount of the nutritional yeast-chia seed topping, and toss to coat.